This card was ranked 5th in my Top 10 list. Anubis is arguably the most famous if not the most recognizable Egyptian god. While the actual Anubis would be either Black or White, Hazoret is a powerful and threatening red creature. Although I prefer the Devotion mechanic for Gods, the Amonkhet gods grew on me. Too bad they are all dead now with the exception of our COTD. 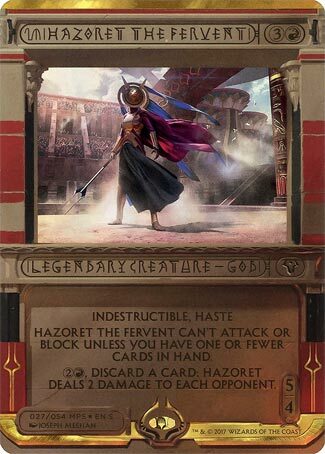 The main reason Hazoret is on this list is due to her explosion in popularity “Ramunap Red.” This variant of Red Deck Wins plays cards hard and fast so by the time you cast her you will only have one or fewer cards in hand, mitigating her drawback. Her ability burns through useless cards for extra damage and you can combine Hazoret with “Chandra, Torch of Defiance” if you really want to turn up the heat. Hazoret curves out perfectly and is the perfect finisher for any aggro red deck. This card was ranked 7th in my Top 10 list. How times change. While Hazoret was merely decently received on Amonkhet‘s release, it was Hour of Devastation and the revival of the long-dormant mono-red aggro archetype in Standard with Abrade and Ramunap Ruins that gave her a home. It turns out that an indestructible 5/4 with haste is just what the deck needed at the top of its curve, and Hazoret’s activated ability is an excellent source of inevitability for the deck. While you might initially balk at her “one or fewer cards in hand” limitation, red often is working with a near-empty hand after its initial salvo, so that’s less a downside and more a feature. She’s likely to be a force for the entire time Amonkhet is legal in Standard, and she’ll probably remain the most popular of the mono-colored gods from the block.